Frequency Matters! The Key to Understanding PEMF (Most Important Chapter!). Intensity is a little easier to understand as it’s just the strength, amplitude or dosage of something (or the amount). Frequency is a little more complex, but its crucial to understanding energy medicine and PEMF Therapy so we'll carefully define it. I promise it will be well worth carefully absorbing this section and the next as it contains the most important thesis on this website, which is the FACT that frequency is the KEY to PEMF therapy, not intensity. And as we'll see, it's specifically the frequency that the earth's magnetic field and ionosphere (Schumann Resonance). These Earth frequencies are primarily in the 0-30 Hz range and they exactly match the frequencies of our body, mind, tissues and cells. So give me your full attention for this page and the next and I promise you'll glean a much greater appreciation for the importance of Earth based PEMF therapy. Let's begin by defining frequency. It's easiest to think of frequency in terms of waves and it is measured in the hertz unit, named in honor of the 19th-century German physicist Heinrich Rudolf Hertz. The hertz measurement, abbreviated Hz, is the number of waves that pass by per second, or the cycles per second or number of oscillations per second. For example, an "A" note on a violin string vibrates at about 440 Hz (440 vibrations per second). The most important application of frequency is in the electromagnetic spectrum, which includes visible light. The mysterious and vitally important photon is the force-carrying particle behind ALL electromagnetic interactions. Basically the photon carries or transmits the "force" responsible for all electrical interactions between charged particles, which are mainly the electron and proton in our everyday world. But the photon does even more. It makes up all visible light, radio waves, infrared waves, x-rays and gamma rays and everything in between which in totality comprises entire electromagnetic spectrum as pictured to the left. The lowest frequencies in this spectrum are radio waves that can have a wavelength up to several hundreed miles. Then, in order of increasing frequency, there is microwaves, infrared, visible light, ultraviolet light, x-rays, gamma rays and cosmic rays. Notice we can only "see" a small tiny “slice” or portion of the electromagnetic spectrum which is visible light. The Sun is a source of most of the electromagnetic rays we experience on a daily basis, which is mostly from the infrared through the visible to the ultraviolet end of the spectrum. Some animals can see into the infrared and ultraviolet, but the human eye can only detect around 400 - 700 nm wavelength which is around 10^14 cycles per second (a VERY HIGH frequency) corresponding to colors red through violet. Infrared is aptly named, as it is just "below" red, and ultraviolet is just "above" violet. Interestingly, the peak emissions from the sun are in this range such that the human eye seemed to evolve in synch with the emissions from the sun. Infrared and ultraviolet are not the peak emission but are definitely present as evidenced in the warmth we feel from the sun (infrared) and the sunburn we can experience from ultraviolet. The earth itself emits frequencies which are all important for life to exist. These are the earth's natural PEMFs that we need as an essential element for life and our health. Let’s take a closer look at the two components of frequency that the earth emits. The first is the resonant frequency of the Ionosphere called the Schumann Resonance and the second is the actual frequency of the earth’s magnetic field called the geomagnetic frequency. ​But main harmonics are still 0-30 Hz. We hear a lot of talk about the Body - Mind connection and while it is important and based on science, it is missing ONE very essential component... 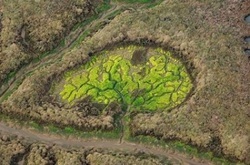 THE EARTH! It's interesting that you can easily rearrange the word "Earth" and get "Heart". The earth is a living organism, and if there were a heartbeat to the earth it would be the Schumann resonance frequencies. Just as a tuning fork has resonant frequencies for sound, so the planet earth and the ionosphere surrounding it have resonance frequencies for electromagnetic radiation called the Schumann Resonances. Basically the ionosphere with the Earth's surface creates a spherical wave-guide that surrounds the earth. Low frequency electromagnetic waves bounce around this waveguide, which is how radio signals can be transmitted around the globe. The fundamental frequency of this spherical cavity of the earth is 7.83 hertz, which, like a tuning fork, is the earth's fundamental "note". These frequencies are excited mainly by lightning strikes (5000 lightning strike every minute) in the cavity formed by the Earth's surface and the ionosphere, but can also be induced by solar flares. More than 7 million lightning strikes the earth each day, which “ring” the proverbial bell of the ionosphere that chimes to the note of 7.83 and higher harmonics or octaves (as we’ll see). This natural frequency pulsation is not a fixed number, but an average of global readings, though the primary fundamental frequency is usually close to 7.83 Hz. The Schumann Resonance actually fluctuates due to geographical location, lightning, solar flares, atmospheric ionization and daily cycles. And contrary to the New Age discussions, the fundamental Schumann Resonance is not rising, at least according to continuous monitoring from geological observatories around the world. And just as a piano has varying octaves of "C", so too does Schumann frequencies have higher octaves or harmonics, the primary ones being in the 0-30 Hz range, which as we’ll see in the next section is the most important frequency range for or body, mind and cells . Note: the first harmonic of 7.83 is by far the strongest with each subsequent harmonic diminishing in intensity. For all practical purpose harmonics above the fifth are virtually non-detectable. **Subharmonics down to 3hz and lower ties in NICELY to Geomagnetic Frequencies (see below) to cover the full 0-50 Hz range of cell, tissue, body and brain frequencies. It is important to note that the Schumann Waves are quasi-standing waves or scalar waves and as such are more fundamental then electromagnetic waves. One simple way to understand this is that the 7.83 Schumann scalar wave is the prime "channel" or broadcasting frequency for all of life on earth. It appears all animals and living organism are tuned to this frequency and its harmonics and it is the most important facet of the Earth PEMF (along with the earth’s magnetic field and its frequencies) that we need for life. We all march to the cadence of this cosmic drummer -- our planetary heartbeat, which sets the tempo for our health and well-being. Below is a CURRENT chart of the Schumann... Note the Schumann Resonance Is NOT rising contrary to what some new age teachers say. This study is also good but gets into variations at different altitudes at which people do not live. BUT the conclusion is the Schumann Resonance frequencies ARE basically the same. Since resonance frequencies and Q of the Earth-ionosphere cavity in the 3–30 Hz ELF range depend upon the electrical conductivity of the space between ground level and 100 km altitude, it is possible to obtain a worldwide average of the atmosphere-lower ionosphere conductivity profile from an analysis of Schumann resonance noise (3–30 Hz) generated by global thunderstorm activity. An iterative procedure is described which involves use of the ELF data for locating the major noise sources (thunderstorm regions) and for determination of the vertical conductivity profile. Geomagnetic field of earth radiates hundreds of thousands of miles out into space. It is a static magnetic field, a stationary field. Amplitude or magnitude does not change much that our compasses tune into. Iron fillings line up in lines. Flux lines. Think of the flux lines like guitar strings, and what happens when you pluck a guitar string? Structural field line resonances. What is plucking the field lines. The solar wind is plucking the field lines. Solar wind blowing 1 million miles per hour. Quiet day. Corona mass ejections, solar flares, up to 5 million miles per hour. Pulls out magnetic field on night side and get magnetotail. We can visualize the ringing field lines. Spectrums of field line resonates. All of these rhythms overlap the rhythms in the human heart and autonomic nervous system. Coherence of heart rhythm is 0.1 hertz. 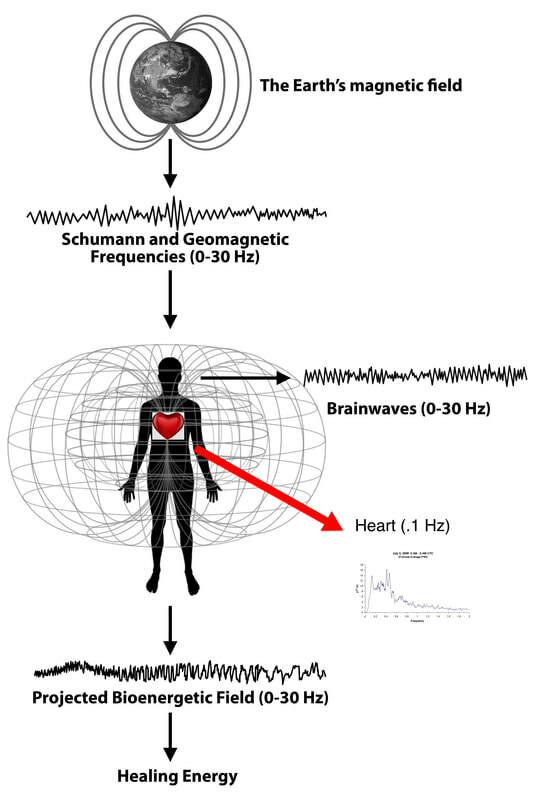 It is well established that the resonant frequencies in the earth’s various magnetic fields directly overlap with those of the human brain, cardiovascular and autonomic nervous systems. Therefore, it should not be surprising that numerous physiological rhythms in humans and global collective behaviors are not only synchronized with solar and geomagnetic activity, but that disruptions in these fields can create adverse effects on human health and behavior. ​When the earth’s magnetic field environment is disturbed it can cause sleep disturbance, mental confusion, unusual lack of energy or a feeling of being on edge or overwhelmed for no apparent reason. Related to all of the above hypotheses is that human emotions and consciousness interact with and encode information into the geomagnetic field and this information is distributed globally. We believe there is a feedback loop between human beings and the earth’s energetic/magnetic systems. The frequency of the pulsations is not steady, but "sweeps" up and down, from 0.3 to 30 Hz (cycles per second), with most of the activity in the range of 7-8 Hz. Confirmation of Zimmerman’s findings came in 1992, when Seto and colleagues, in Japan, studied practitioners of various martial arts and other healing methods. The "Qi emission" from the hands is so strong that they can be detected with a simple magnetometer consisting of two coils, of 80,000 turns of wire. Again it was found that the Qi Kung Practitioners emitted the same frequency range of 0-30 Hz. 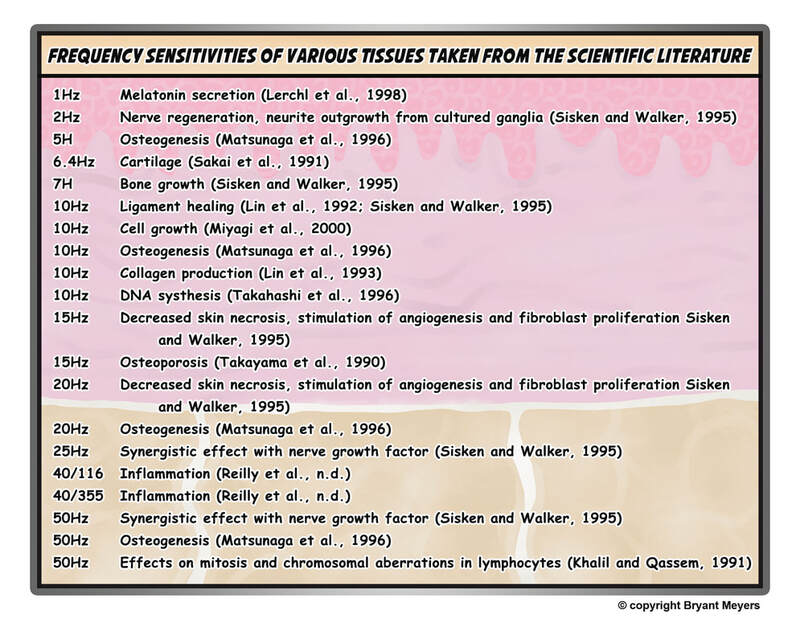 This is important, because next we are going to discuss perhaps the MOST important insight on this site, namely the BODY - MIND - EARTH Connection and why 0-30 Hz is the most important healing frequencies the body needs (and the earth gives us!). (***Speculative but still provoking) The Frequencies of the Earth's Magnetic Field according to Klaus Piontzik (11.75 and 11.79 Hz). If you look at a compass under high magnification, you will see that it vibrates and fluctuates. The earth's magnetic field is not a constant magnetic field like a bar magnet, but varies with time and it has a measureable frequency just like the Schumann resonance from the Ionosphere. Compelling evidence of the earth’s geomagnetic frequencies is found in Klaus Piontzik’s book, "The Lattice Structure of the Earth's Magnetic Fields" whereby Piontzik lays out a derivation of the fundamental frequency of the earth's magnetic grid. Using Fourier analysis and geomagnetic data from 200 measuring stations around the world, Klaus has discovered that the earth's magnetic field has an oscillating structure with source points coming from four poles (not just two). That is, the earth is a quasi-quadruple. His model shows that several of the popular energy grids (the basis for lay-lines in dowsing) such as the Hartman grid, Curry grid, and others are actually harmonics within the earth's actual geomagnetic field and its frequencies (see image to the left). The earth's magnetic field is MORE than just a static or DC (direct current) field; it has a frequency harmonic as well. This frequency was found by Piontzik to be 11.79 Hz at the poles and 11.75 Hz at the equator. The difference coming from the fact that the Earth "bulges" at the equator due to centrifugal forces of its rotation. It is important to note that the primary frequencies and harmonics for both the Schuman and geomagnetic frequencies lie within 0-30 Hz. As we'll see, this 0-30 Hz is the primary window of frequencies that the earth emits and also that the human body, mind and cells resonate to which is one of the main points on this website.